What do you get when you combine “the passion of 90 independent farmer owners”, “damn good dairy”, “Pacific Northwest berries”, and some “honest Oregon grit”? The answer, Tillamook Farmstyle Greek Yogurt, is given in the latest commercial released by the dairy brand. 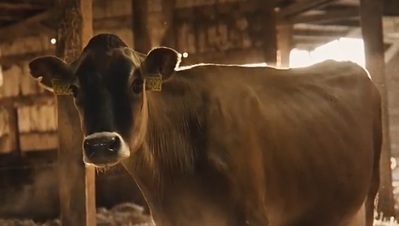 The 30-second spot, titled “This is Farmstyle”, features some of the independent farmer owners, with one of them getting to work before the crack of dawn, a cow that seems to wink, berries smashed with a hammer, a truck driver with earphones on and a dog as his travel companion, and some farm workers, illustrating the “Oregon grit”. Eventually, a hand is shown holding a spoonful of Tillamook Farmstyle Greek Yogurt reversed to prove that it doesn’t fall, and that it is “richer”, “creamier” and “tastier”. The final onscreen line is the brand’s tagline, “Dairy done right”. The song playing in the background is the single “Satoshi Nakamoto” by the Slovenian-American hip hop and electronic music producer Gramatik (Denis Jašarević by his real name), from his 2016 album “Epigram”.